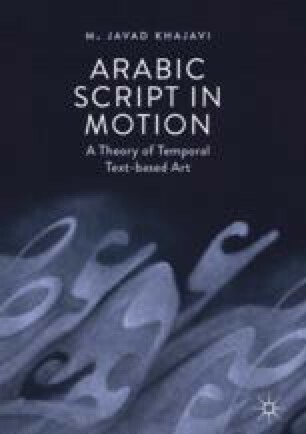 This chapter focuses on another transformative scenario in which the transformation is not necessarily the result of a change in the shape of calligraphic forms, but is rather the consequence of a shift in the function of calligraphy. This kind of transformative quality, which can be observed in many specimens of Islamic calligraphy and neo-calligraphy, is called meta-transformation. First, by providing examples from traditional Islamic calligraphy, it is explained how a specimen of calligraphy may transform into an image without a change in the identity of its calligraphic forms. This is followed by an inspection of cases in which the meaning of glyphs, letters, and words transforms and becomes loaded with metaphorical and symbolic meanings, effectively becoming much more than mere linguistic signs. It is argued that in both these cases it is in fact the function of calligraphy that transforms. This chapter then examines three major functions of calligraphic forms in calligraphic art: “aesthetic,” “semantic,” and “hermeneutic.” It is argued that in many calligraphic artworks there is a tension between these three (or at least two of these three) functions, and that these tensions can appear over time in time-based media. Furthermore, this chapter proposes a general category of temporal events that may lead to a shift in the function of calligraphy. In conclusion, issues of legibility and readability are revisited as one of the consequences of the shift in the function of calligraphy over time.